Examines the primitivizing critical fantasies that motivate and shape white and masculine readings of black women's texts and calls for the "complementary theorizing" of black and white feminists. Modlewski works with Smith to unfix territorializing racial definitions, attempting to reenact, at the level of theory, Smith's performative unsettling of cultural oppositions between Jews and blacks, while also challenging Smith's subordination of gender to race. 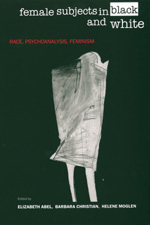 Examines the gender dimensions of critical debates in the late 1980s between African American feminists and prominent male African American theorists concerning the figurative versus the literal or embodied character of race and joins black feminists who refuse to repudiate the claims of the literal, the body, the female. Examines the desires and fantasies that mark recent white feminist readings of black women's texts and argues that despite their wide range of critical strategies, these readings emerge from a desire to share the cultural authority produced in part by black women's enforced experience of embodiment. Essay attempts to move the African American "community" from its stable position as an object of social science inquiry to a more uncertain locus as the subject of a psychoanalytic culture criticism. Argues that the Lacanian Real offers interpretive leverage by exceeding the endless repetitions of the Imaginary and the social structures of the Symbolic and tries to induce a "rupture of the Real" through author's reading of the sentimental visual rhetoric of a photograph by George Cook of an African American nursemaid holding a white child. Reads Our Nig as an expose of White American culture's repressed relation to American Africanism and as an exploration of the particular challenges and possibilities of cultural production that exist for African Americans who inhabit the cultural shadows of slavery. Argues that because Sethe, in Morrison's novel, is forced by the violence of slavery to assume the mythic function of the primal mother, the fiction exposes the ways in which apparently timeless modes of psychic functioning are constructed and enacted within history. Shows how the assumptions that have limited the revisionary project of contemporary white feminists also shaped the interpretive work of early women analysts and their patients who ignored the influence of race in the construction of women's gender and sexual identities. Uses Kohut's theory of narcissism to analyze Larsen's protagonist, Helga, and her own reading of Helga to force a reconsideration of Kohut's selfpsychology in the context of considerations of class and race. Argues that in Passing, cultural prohibitions against miscegenation and homosexuality converge in order to produce a normative heterosexuality (with its gender differences) that guarantees the reproduction of racial purity. Explores intertextual connections between Shirley Anne Williams' novel Dessa Rose and two precursor texts: William Styron's Confessions of Nat Turner and Pauline Reage's Story of O. and shows how William's novel reveals, without reproducing, the power dynamics that produce ideologies of desire in the other fictions. Examines the ways in which Pauline Hopkins--in Of One Blood--used late-nineteenth-century discourses of the unconscious (particularly the writings of William James) to explore the political situation and complex subjectivity of African Americans in Post-Reconstruction America. Considers the ways in which the work and lives of two African American women poets have been shaped by a form of spiritual receptivity that, rooted in African practice and belief, provide significant continuity for the African American community. Linking spiritualism and Africanity to identity politics, Shaw examines them all as postmodern phenomena that reflect a need for origin stories and celebrate local knowledges. Reads Morrison's novel from the perspective of an African cosmology that affirms the continuity of past and present in the naming and nurturing of embodied spirits and shows how Beloved serves as a "fixing" ceremony: an act of remembrance that initiates the healing of a psychic wound that was originally inflicted by an individual and collective act of forgetting. This landmark collaboration between African American and white feminists goes to the heart of problems that have troubled feminist thinking for decades. Putting the racial dynamics of feminist interpretation center stage, these essays question such issues as the primacy of sexual difference, the universal nature of psychoanalytic categories, and the role of race in the formation of identity. They offer new ways of approaching African American texts and reframe our thinking about the contexts, discourses, and traditions of the American cultural landscape. Calling for the racialization of whiteness and claiming that psychoanalytic theory should make room for competing discourses of spirituality and diasporic consciousness, these essays give shape to the many stubborn incompatibilities—as well as the transformative possibilities—between white feminist and African American cultural formations. Bringing into conversation a range of psychoanalytic, feminist, and African-derived spiritual perspectives, these essays enact an inclusive politics of reading. Often explosive and always provocative, Female Subjects in Black and White models a new cross-racial feminism. Elizabeth Abel is Associate Professor of English at the University of California, Berkeley; her books include Virginia Woolf and the Fictions of Psychoanalysis. Barbara Christian is Professor of African American Studies at the University of California, Berkeley; her books include Black Feminist Criticism: Perspectives on Black Women Writers. Helene Moglen is Professor of Literature at the University of California, Santa Cruz, and author of Charlotte Brontë: The Self Conceived, and The Anxieties of Indeterminacy: Subjectivity, Sexuality, and the Emergence of the English Novel.